The infinite height adjustment gives ideal ergonomic positioning for operator fatique reduction and achieving greater efficiency. Workbenches are supplied built up. 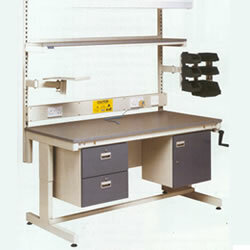 Workbenches 730-950mm infinite height adjuctment.